Against all odds, Radio Shack is still in operation today. They still sell a fairly broad selection of discrete components for circuit designers and for repair and modifications. Radio Shack is and has been for a couple decades the only hometown source for parts where you can walk in off the street to get what you need, rather than order it online. Even items like a dual-gang stereo volume control potentiometer, a 2-layer, 6-position rotary switch, and a DPDT PCB-mountable relay can be had. There are nowhere near as many as there were a few years ago before all the turmoil began, but Radio Shack is still there in a pinch. 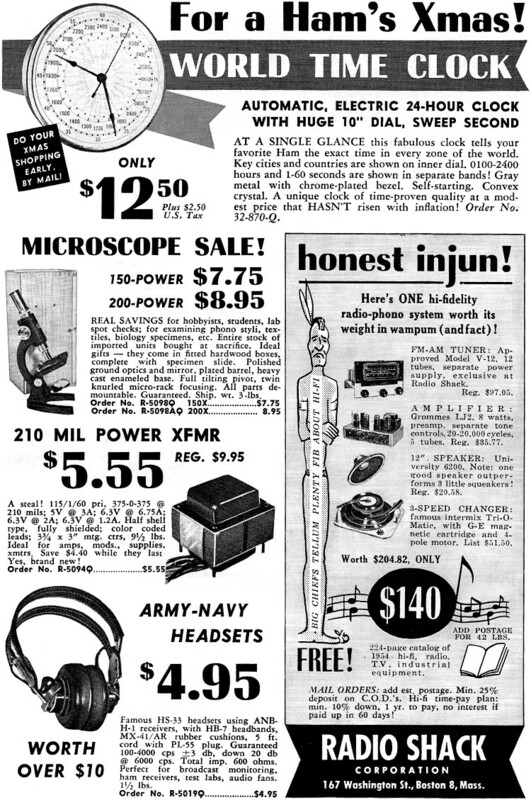 This full-page Radio Shack advertisement appeared in the November 1953 edition of QST magazine, which was during the heyday of electronics DIY activity. I've written in the past of visiting the local Annapolis, Maryland, Radio Shack store with a bagful of vacuum tubes from our television set needing testing on their testing machine. 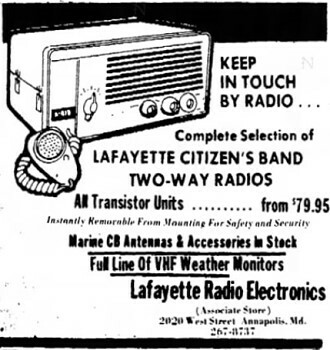 There was also a Lafayette Radio Electronics store (see ad at left) with an even larger array of components nearby as well. Here's one hi-fidelity radio-phone system worth its weight in wampum (and fact) ! 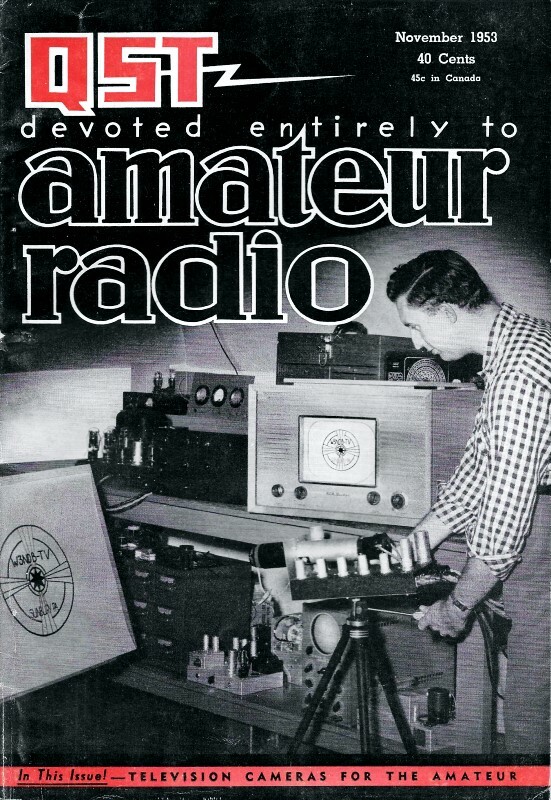 FM-AM Tuner: Approved Model V-12, 12 tubes. separate power supply, exclusive at Radio Shack. Grommes LJ2, 8 watts, preamp, separate tone controls, 20-20,000 cycles, 5 tubes. Reg. $35.77. 12" Speaker: University 6200. Note: one good speaker outperforms 3 little squeakers! Reg. $20.58. 3-Speed Changer: famous intermix Tri-O-Matic, with G-E magnetic cartridge and 4-pole motor. List $51.50. Add Postage For 42 LBS. 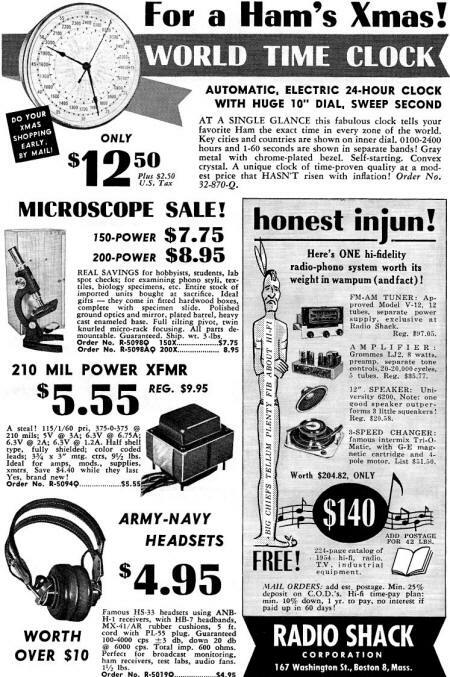 224-page catalog of 1954 hi-fi, radio, T.V, industrial equipment. Mail Orders: add est postage. Min. 25% deposit on C.O.D.'s. Hi-fi time-pay plan: min. 10% down, 1 yr. to pay, no in5terest if paid up in 60 days! 167 Washington St., Boston 8, Mass.